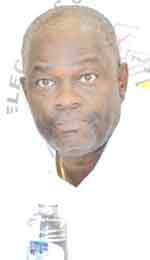 The Chairman of the Guyana Elections Commission (GECOM), James Patterson, has informed President David Granger that general elections should be possible in November 2019 after house-to-house registration, but the opposition People’s Progressive Party’s (PPP) elections commissioners said such a process is not grounded in law or policy. The GECOM Chairman also asked the President to provide GYD$3.5 billion to conduct the general elections and 10 regional council elections later this year, as the existing funds are to be used for house-to-house registration. 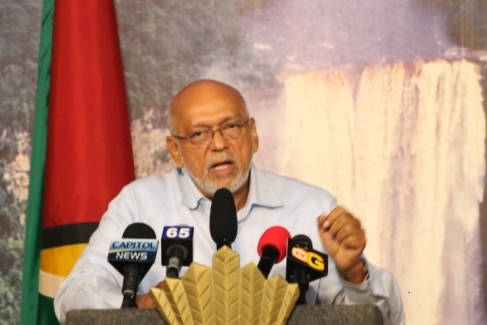 President David Granger has instructed the Chairman of the Guyana Elections Commission, (GECOM) Justice (Ret’d) James Patterson, to commence preparations for the General and Regional Elections. 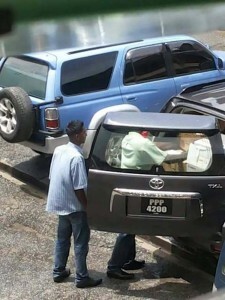 Persons packing items and boxes into the SUV. Officials of a number of Government agencies and Ministries seem to be packing up and leaving, ahead of the official announcement of the winner of Monday’s General and Regional elections. Yesterday, amidst reports of movements of files and other official documents, Kaieteur News managed to determine that this was indeed the case. President Donald Ramotar casting his ballot at St. John’s College. President Donald Ramotar, his wife Deolatchmie and other relatives casted their ballots at the St. John Secondary School, Waterloo Street, Georgetown on Monday May 11 as the nation goes to the polls in General and Regional Elections. 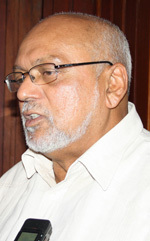 GEORGETOWN, Guyana — Guyana’s attorney general and minister of legal affairs, Anil Nandlall, has claimed that the newly formed APNU/AFC (A Partnership for National Unity/Alliance For Change) coalition of political parties has no foundation in law. 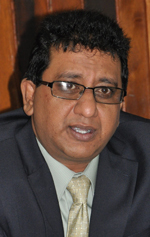 Nandlall said that the document is fraught with a number of worrying concerns for the Guyana electorate. President Donald Ramotar this evening announced the dissolution of parliament to pave the way for general elections on May 11th. The President had been criticised for not announcing the dissolution earlier. Following is the full text of his address to the nation. My fellow Guyanese, as you will recall I prorogued Parliament on November 10, 2014. In doing so, I indicated that I was opting to preserve rather than end the life of the 10th Parliament. I was also attempting to avoid further political conflict and seek avenues of political accommodation between my government and the parliamentary opposition parties.I had hoped that the period of prorogation would have allowed for extant tensions to ease and for all of the parliamentary parties to constructively engage the government. At all times I have acted in accordance with the Constitution of Guyana. The government is not remotely willing to allow a debate on the Alliance For Change’s (AFC) sponsored No-Confidence motion and has therefore decided to go to the polls. This was made known yesterday as President Donald Ramotar addressed the media at State House. The President said, as well, that he has communicated with the international community alerting of the “possibility” of early elections and the desire for observers. The Leaders of the Combined Parliamentary Opposition made their intentions clear yesterday as the presentations to the 2012 Budget debates came to an end by sending an unwavering message that it will be altered and tailored to reflect the will of the people at the recently concluded General and Regional Elections. Today, the House will dissolve itself into the Standing Committee of Supply, where each allocation will be addressed specifically by the Members of Parliament, at which time various amendments can and seemingly will be made. Leader of the Parliamentary Opposition, Brigadier (retd.) 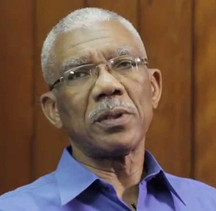 David Granger, in his maiden presentation to a Budget Debate, declared that March 30, 2012, represented the end of an era.